We bet after watching the teaser trailer you cannot wait to catch the film. Aishwarya Rai, Ranbir Kapoor and Anushka Sharma’s Mushkil is an unusual love story that is all set to release this Diwali on October 28. It is the most awaited movie for many reason. Its a Karan Johar movie and is a love triangle movie. The movie also stars suave and handsome Pakistani actor Fawad Khan to create a complicated story. It has beautiful and gorgeous Aishwarya Rai after her Jazba stint. And ofcourse the chemistry between Aishwarya Rai and Ranbir Kapoor. After split with Katrina Kaif everyone is keen on seeing Ranbir on big screen and how he sizzles with other heroines. 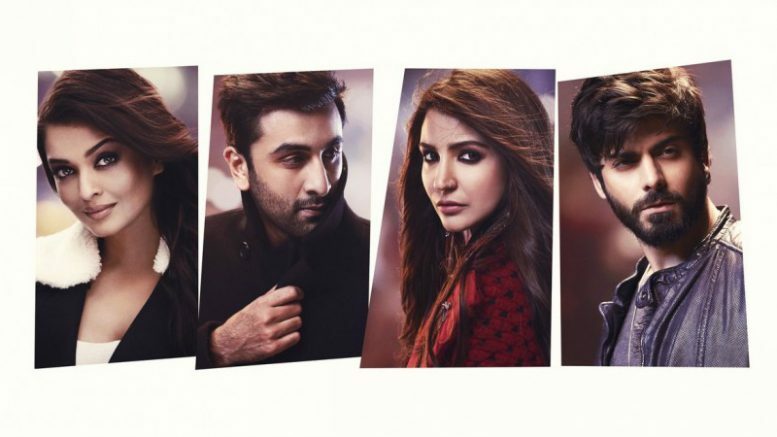 There is so much in the movie why not to begin with the teaser of Ae Dil Hai Mushkil. The teaser trailer gives us a glimpse at all four characters in the film. Happy to see Ranbir Kapoor of Rockstar and Jawani Deewani back on track after a long time. The last film that we saw KJo take the director’s seat was Alia Bhatt, Sidharth Malhotra and Varun Dhawan’s debut Student Of The Year. Not to forget Johar also has a penchant for good music and by soundtrack we don’t just mean the peppy numbers, but also some soulful melodies. The title track is sung by Arijit Singh and composed by Pritam. Anushka Sharma turns a cover girl, and you cannot miss her ‘Bawse Lady’ look. Be the first to comment on "Watch: Ae Dil Hai Mushkil video teaser and audio release today"